Heterochromis multidens, an Ancient Cichlid by Oliver Lucanus. A modern fish gives us a glimpse of ancestral cichlids. New Goby Cichlids from Lake Tanganyika by Patrick Tawil. Cute, and so much more, goby cichlids reveal some of their secrets. The Large Sand Sifters of Lake Malawi by Ad Konings. Big and beautiful fish with fantastic feeding and breeding adaptations. Neolamprologus olivaceous (Brichard, 1989)by Pam Chin. Some Neolamprologus brichardi types need the “Murder Method” before they breed. The Blackthroat cichlid, Amphilophus macracanthus (Günther, 1864) by Juan Miguel Artigas Azas. 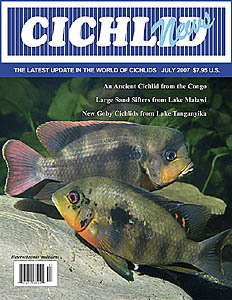 An attractive and interesting cichlid that you can breed.